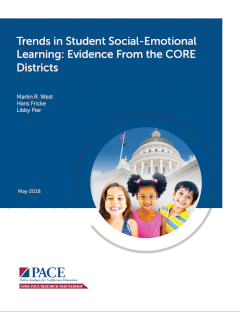 Mounting evidence demonstrates that social-emotional skills are important for students’ academic and life success, yet we have limited evidence on how these skills develop over time and how this development varies across student subgroups. In this study, we use the first large-scale panel survey of social-emotional learning (SEL) to describe how four SEL constructs—growth-mindset, self-efficacy, self-management, and social awareness—develop from Grade 4 to Grade 12, and how these trends vary by gender, socioeconomic status, and race/ethnicity. Our results are based on self-report student surveys administered in the 2014-15 and 2015-16 school years to roughly 400,000 students within the CORE Districts, a network of urban school districts in California. We simulate cohort trends for students continuously enrolled in six districts within CORE by adding the mean change at each grade level observed among students surveyed in both years to the mean scores of Grade 8 students in 2015-16. We find that, with the exception of growth mindset, social-emotional skills do not increase monotonically as students move through school. Self-efficacy, social awareness, and to a lesser degree self-management decrease after Grade 6. Trends in SEL also vary by subgroup. Female students report higher self-management and social awareness than boys, but their self-efficacy drops sharply relative to boys in middle and high school. Economically disadvantaged students report lower levels of each social-emotional construct, but gaps in self-management, growth mindset, and self-efficacy narrow in high school. White students report higher levels of social-emotional skills than African American and Latinx students; Asian students report levels of self-management similar to White students but exhibit declining self-efficacy over time. While our findings cannot be generalized beyond the California districts we study, the scope and scale of our data far exceeds anything in the extant literature.